The reputation of Derry-Londonderry as an emerging foodie destination has gained significant momentum in recent years, thanks in large part to the development of small artisan eateries where a deliberate focus on provenance and personal service is delighting locals and visitors alike. 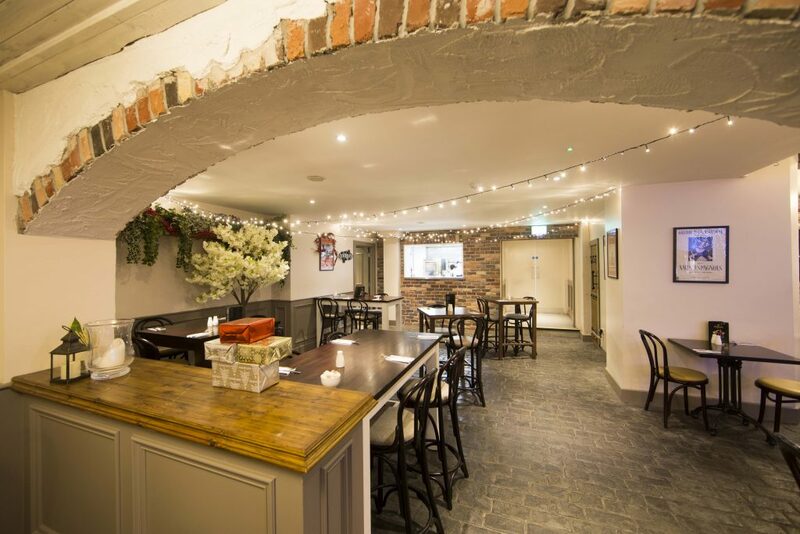 Among those in the vanguard of the Derry-Londonderry’s evolving food culture is husband and wife team Melanie and Ciaran Breslin, whose popular Primrose restaurant brand is a prime example of the way in which small, atmospheric venues with an emphasis on local and Irish cuisine are helping drive the transformation. 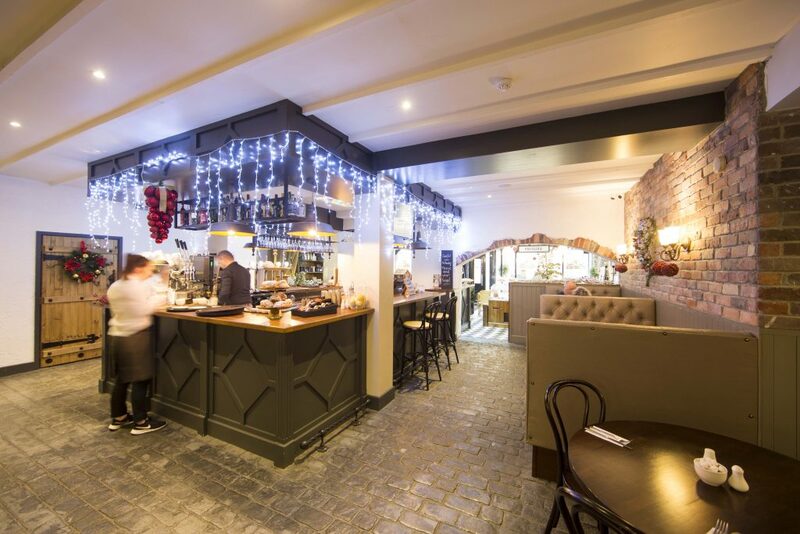 The Breslins currently have two restaurants in the city – their main outlet on the Strand Road, which they opened in 2017 following a move from their original base on Carlisle Road, and a second, riverfront eatery, Primrose at the Quay, which opened in 2014. ‘Melanie and I are both food freaks and we love to travel,’ he told LCN recently ‘Everything is really food-orientated with us when we’re away and we always go out for a nice breakfast wherever we happen to be. Eventually, it struck us, that there was nowhere in Derry where you could go to get a really nice breakfast and I think the idea just grew from that. 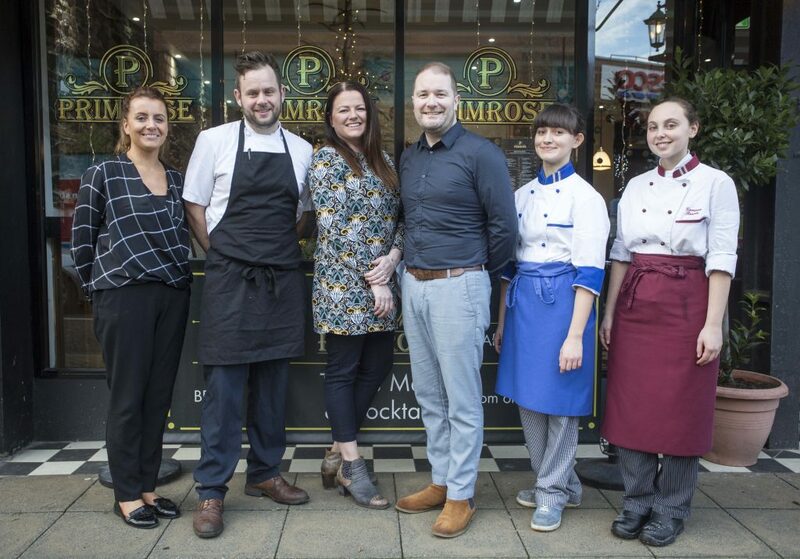 Pictured outside The Primrose on Strand Road are Shelley McLaughlin, general manager; Bryn Evans, head chef; Melanie and Ciaran Breslin, proprietors and trainee bakers, Giovanna and Ilaria. Primrose opened its doors for the first time in 2011 on Carlisle Road. ‘As soon as we opened the doors, it grew legs and it hasn’t stopped since. It’s been fantastic,’ says Ciaran, who is a butcher by trade and still operates a successful butcher’s shop on the city’s Buncrana Road. Another of the key planks of Primrose’s success is its famous ‘scratch bakery’, which is now based at its Strand Road premises. Melanie has been an enthusiastic baker all her life, often supplying family and friends with her highly sought-after cupcakes and scones. As the couple began to realise the commercial potential behind Melanie’s culinary skills, they started to sell her produce via Ciaran’s butcher’s shop, eventually establishing a stand-alone bakery at the Skeoge Industrial Estate on the Beraghmore Road. Then, when they moved the Primrose from its original base on Carlisle Road to its new home in the town centre in 2017, they took the opportunity to integrate the scratch bakery on the same site. ‘A lot of what we produce at the Primrose now is based on recipes from Melanie or her grandmother and we haven’t changed the way we do them since we started,’ adds Ciaran. ‘I don’t think that we thought Primrose would be as successful as quickly as it was,’ says Ciaran. ‘What really surprised us was the public reception, which was fantastic. A total of 40 staff are currently employed across both Primrose outlets. Head chef at the main Strand Road restaurant is Bryn Evans, an experienced chef and one of Ciaran’s neighbours. He stepped into the breach some months ago when the previous chef moved on and he’s become an invaluable addition to the staff, says Ciaran. The Strand Road venue seats around 40 customers at the front of the premises where they can experience a more bistro-orientated ambience. 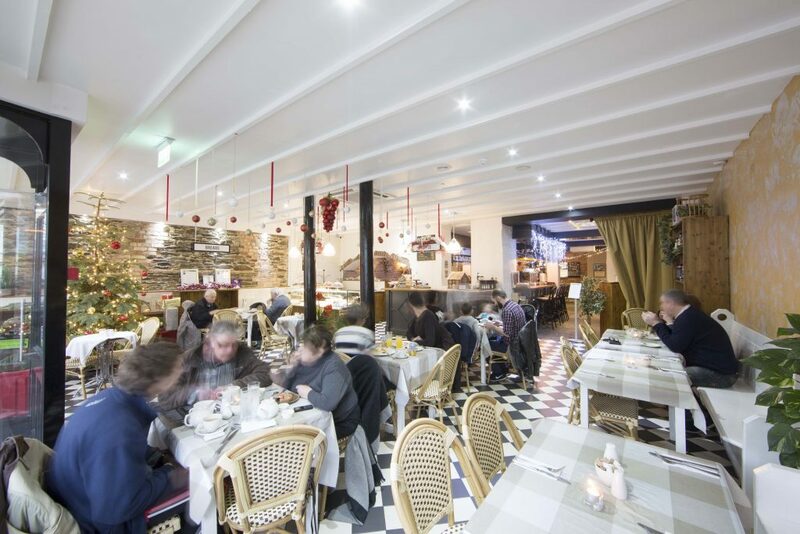 At the rear, where the atmosphere is much more that of a traditional restaurant, there is room for about 75 more diners. Around 60 diners can be accommodated at the smaller outlet on the quay and they can enjoy stunning views across the River Foyle, which is only about 15 yards from the front door. Ciaran agrees that Derry-Londonderry definitely has a burgeoning reputation as a foodie destination – and it’s a label that’s happy to encourage. He sits on a steering group which has just been formed by Derry City Council with the aim of developing the region’s culinary credentials and draw in more tourists. ‘We’re going to be presenting an action plan this month that we think is going to help traders to get behind tourism and bring more people into the city to enjoy our food offering,’ reveals Ciaran. ‘Our dream would be to open another premises somewhere outside the city,’ he adds. ‘We have nowhere in mind, but I don’t think that a third place in Derry would work.